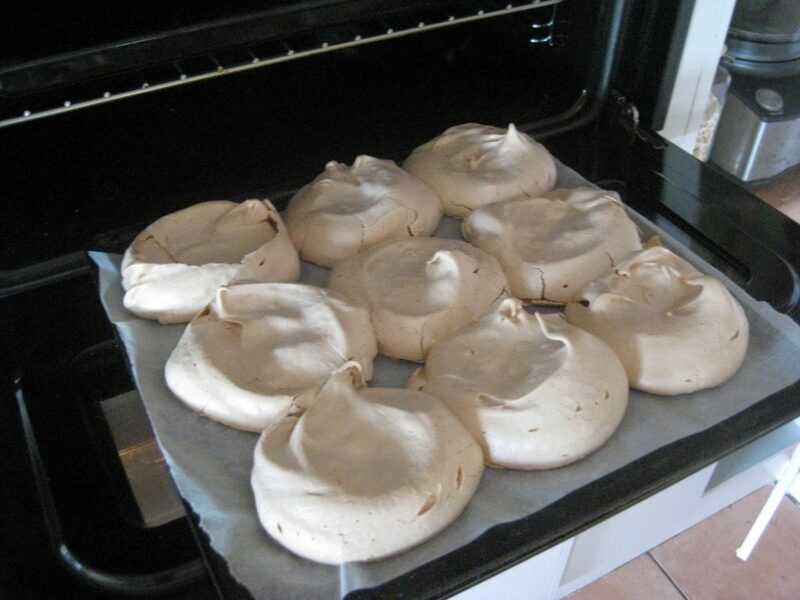 Meringue – top tips for perfection! It has taken me 40 years of trial and error, mostly error, to finally get this right so I thought I would pass on what I have learned about making the perfect meringues – it’s really easy, once you know how – and it’s really worth it!! This all started because we were having a party and I had to make dessert for about 40 people – and I don’t have a spare fridge. It is forty years since we came to Australia with a suitcase, an eight month old and a dream for a brighter future! We thought this was worth celebrating and I think that it is always the right time to be grateful – so party time it was! Anyway, it was damn hot and numbers for party still very fluid – what to make? This is where meringues come into their own. WHY? They can be made in advance (up to three weeks), can be in any shape or size you like AND THEY DON’T HAVE TO BE KEPT IN THE FRIDGE – any airtight container will do, and you can, on the night, turn them into something impressive and delicious with a bit of fresh fruit and some whipped cream. They were also in keeping with our Aussie theme – pavlova being a traditional Australian dessert – these were just going to be hand held ones to reduce the washing up. Have them at room temperature. Use very clean and dry utensils and don’t mix in a plastic bowl (they absorb grease – which is bad for meringue making). Make sure the sugar is lump free. When you are separating the eggs, make sure that not a skerrick of yolk gets into the white. And most important of all – DON’T OVER-BEAT. This is actually your secret to success and where I have gone wrong before. Over-beating usually means that the meringues will end up soft and chewy with globules of caramelised sugar on the outside, instead of crisp and crunchy on the outside and a bit chewy in the middle. 1. Turn oven on to 150oC. 2. Whip egg whites – electric hand-beater is best – until they begin to form soft peaks – now STOP beating. 3. In a steady stream – with beaters on low – pour the sugar slowly into the egg whites (this is where an eager grandchild with a promise of post bowl-licking comes in handy!). 4. When the sugar is combined, increase the speed to high and whip again until soft peaks form then STOP. It doesn’t matter if the meringue is still a bit grainy from the sugar. 6. Make a little nest in the middle to later accommodate cream/fruit/grated chocolate filling. 7. Bake in oven for 35-45 minutes. Meringues should be firm to touch. 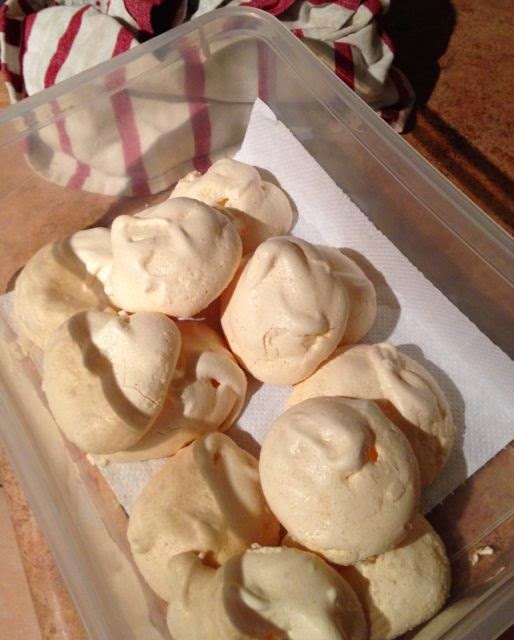 Turn off oven, open door and leave meringues in oven to cool. 8. 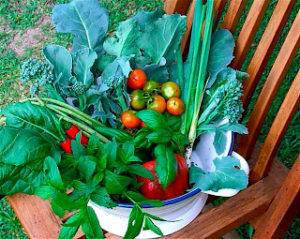 When completely cool, store in airtight container until needed. Serve with whipped cream and fruit. 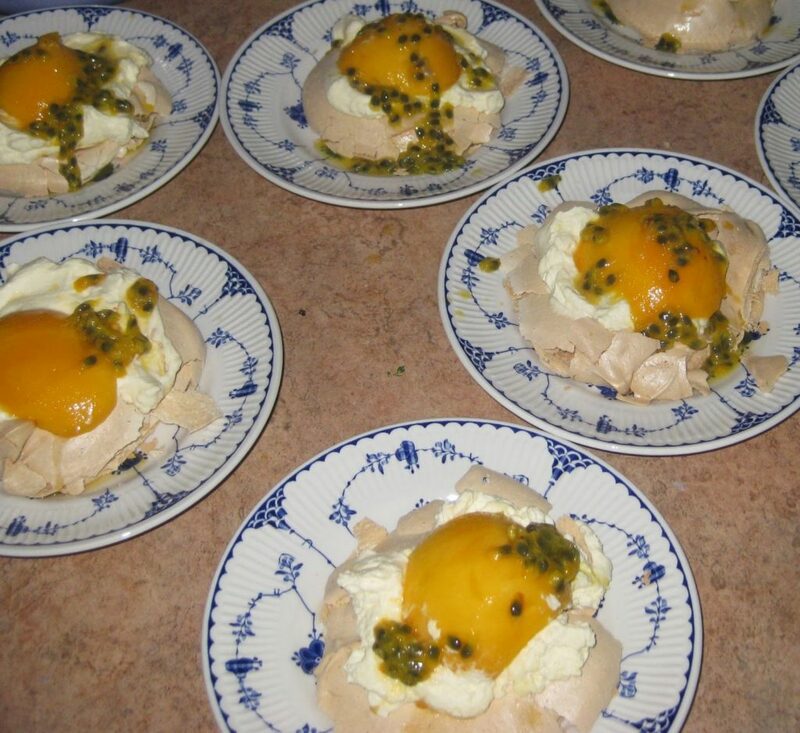 Last year for Easter I thought I would do a different take on Easter eggs and made ‘egg’ meringues with poached peaches and passionfruit – they were pretty good. For the party we had them with strawberries and mango – a bit of chocolate flake on top would have been even better. Easter meringue eggs. This batch were not as good as the perfected recipe above – they broke up really easily – not that anybody complained. I have very few gadgets in my kitchen but one I couldn’t do without is a simple electric hand beater. This one was bought for me as a wedding present 43 years ago and has certainly seen a lot of whipping and beating, but finally telling me its’ sentence was served and going up in a puff of smoke during its’ last outing. My knew one has an LCD display panel, timer, 14 speeds and very annoying beeping – can anybody tell me if this is progress and I seriously doubt that it will last for 43 years but, then again, I won’t either. 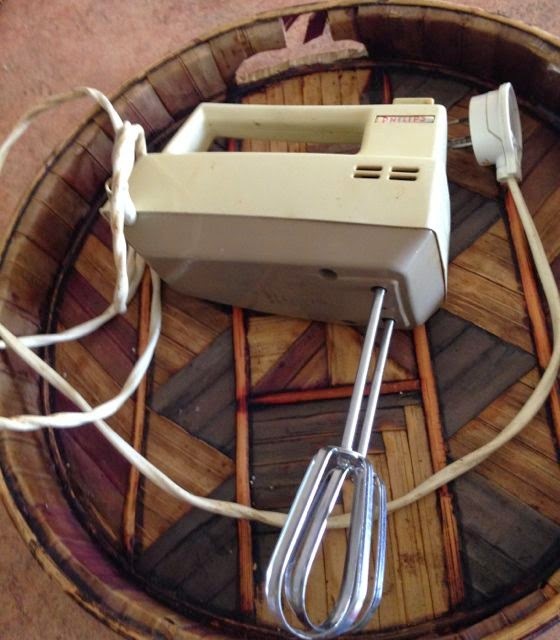 My 43 year old Phillips electric beater – sadly now deceased. I wonder if anyone has an older working appliance? Make them any size you want! 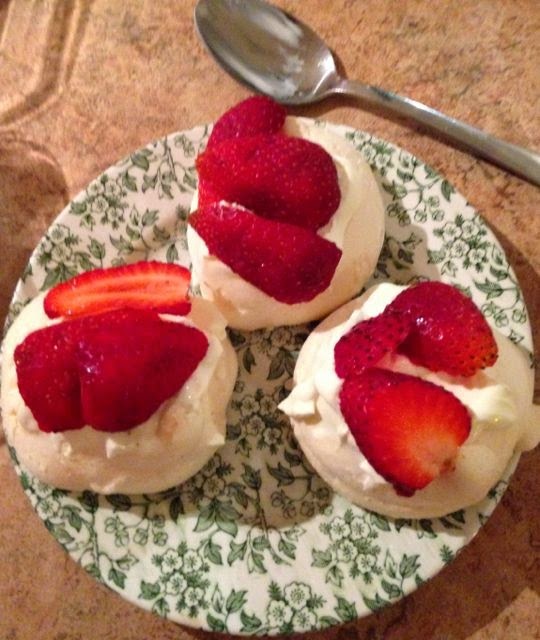 They can be the size of a plate and piled up to make a pavlova. We recently went to a Turkish film and dinner night at our local community hall and my clever friend, the chef, had turned meringue into tiny minarets – stunning and yummy! Heard of Eton mess? Well, it’s just broken up meringue, fresh berries and whipped cream in a glass bowl – easy eh! And don’t worry about wasting the left-over egg yolks – turn them into: omelette, fritata, creme caramel or custard for trifle.